1. What is an Initiative? An Initiative is a bigger task/project/epic story, which lives at the Initiatives Workflow (1). The initiative is a big chunk of work that you need to break down into smaller and manageable work items/cards to be accomplished. The smaller actionable steps (cards) are linked to the Initiative as child cards and they give your entire team the scope of their work. All child cards are created on the Cards Workflow (2). To get a better idea about the concept, please watch the video: "How to use Initiative Workflow". The Initiative moves through the Initiative workflow completely automatically when its linked child cards are processed in the Cards Workflow lane or anywhere in your account. How does the automation of the Initiatives Workflow work? The built-in automation updates the status of the Initiatives, so their progress can be easily tracked. 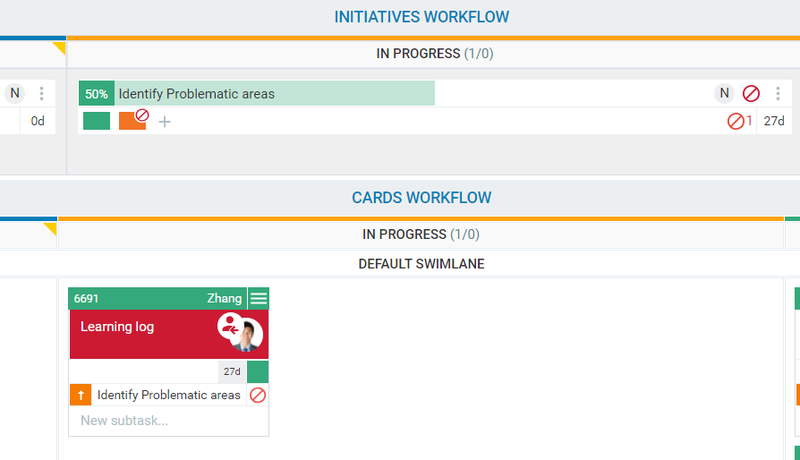 When a team member moves a Child card, which has been linked to an Initiative to the "In Progress" column on the Cards Workflow lane (Team Board level) -> the Initiative card will automatically move to "In Progress" in the Initiative Workflow. When all child cards, linked to the Initiative are moved to "Done" on the Cards Workflow lane (Team Board level) -> the Initiative card will automatically move to "Done" in the Initiative Workflow. This helps managers to see at a glance the completion status of all Initiatives that they have in the organization. 2. How to create an Initiative? 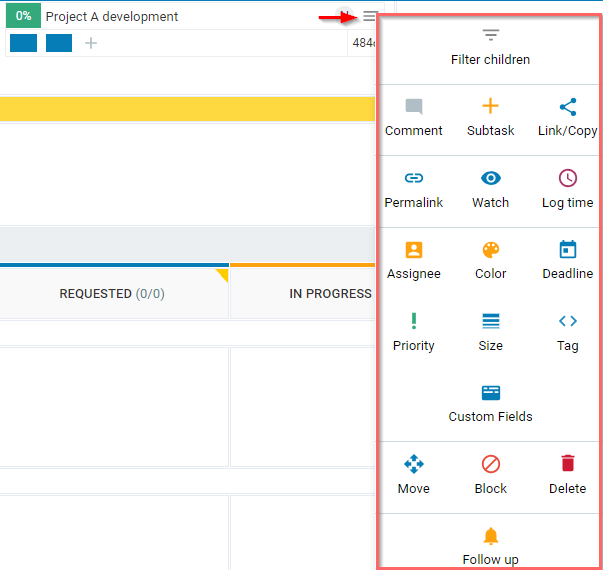 А user can create an Initiative in the "Requested" column of the Initiatives Workflow only. 2.1 Right-click in the Requested column of the Initiative Workflow lane and create the Initiative. The Initiative appears as a Kanban card including all the card properties -> fill in the information related to the Initiative and аdd it to the lane. The Initiative is visualized as a rectangle - double click to open it. Tip: Click the plus icon of the Initiative to break it down and start creating its child cards. 2.2 Another way to create an Initiative is using the green plus icon at the top right side of the board interface -> Create new Initiative. 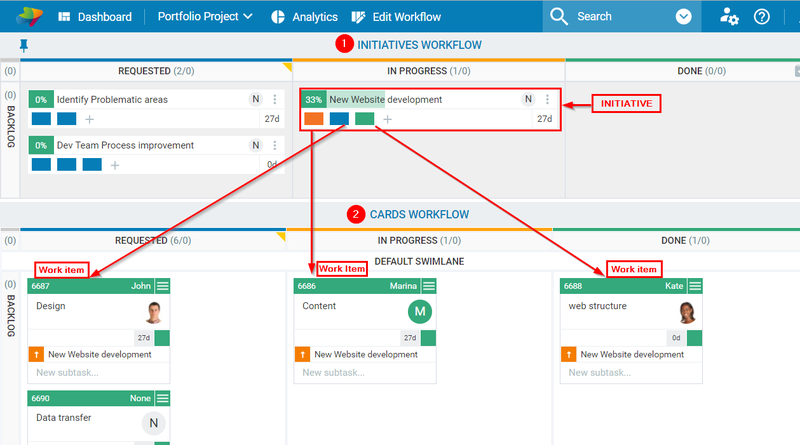 2.3 Drag & drop an existing card from your Cards Workflow lane to the Initiatives Workflow. The system prompts you to select either Create New parent card or Convert to an Initiative. If you select Create New parent card-> the card you dragged will trigger an Initiative creation and will be automatically linked to it as a child card. Afterward, it will be positioned back at its previous board location. If you select Convert into Initiative -> the card will instantly become an Initiative, without any relations. Note that the card will be no longer available. 2.4 You can create an Initiative of multiple cards, using the drag & drop option. Select a group of existing cards (by drawing a box around them) that belong to one project/a bigger task or epic -> drag & drop them to the Requested column of the Initiatives Workflow lane. The first card in the row will be duplicated as an Initiative and all the other project related cards (including the one that triggered the Initiative creation) will be automatically linked to it as child cards. Once the Initiative is created, all cards in the batch will be placed back in their previous positions on the Cards Workflow. Once you create an Initiative, you have to break it down into smaller work items/cards. Once you create the work items on the Cards Workflow lane of the same Board or any other Board in your account, leave it to the team to process and complete the tasks. As they progress, all the important changes will be reflected in the Initiatives. Each child card linked to the Initiatives is represented by a colored rectangle that holds details for the child card (on hover). For Example: In the image below, you can see that the Initiative named "New Website development" holds three child cards. One of them is "In Requested" column (this is the blue one); the other (colored in orange) is in "In Progress" column and the last one (colored in green) is completed. Double Click on each of the rectangles to directly open the child card and check its details or leave your comment via the "@" symbol. In case that a child card is blocked, the Initiative card will be blocked/colored in red too. The Project manager should resolve the problem as soon as possible in order to unblock it. Each Initiative has a Progress Indicator bar that shows the percentage of the completed child cards. For example: If two out of five child cards linked to the Initiative are moved to "Done" on the Cards Workflow lane, the progress indicator displays 40% of completion. When all child cards linked to the Initiative are moved to "Done", the Initiative progress indicator displays 100% and the Initiative will be considered completed. This is the default behavior of the feature. For example: if we have two completed child cards (out of 5), which are sized "2", the Progress Indicator bar will display 23%. If a single card sized "10" is moved to Done, the Progress bar of the Initiative will display 56% of completion. This gives a better perspective on the progress of tasks ranked in different categories of difficulty. Right-click on an Initiative to open the Context menu that provides shortcuts to a variety of options. The Filter Children option is at the top of the menu is only relevant to the Initiatives. Click it and all child cards linked to the Initiative will be filtered out on the Cards Workflow lane. Read the following article to find out how to breakdown an Initiative into smaller work items.